Trenton Doyle Hancock (born 1974 in Oklahoma City, OK) is an American artist based in Texas. He received a BFA from Texas A&M University-Commerce. While in there Doyle worked as a cartoonist for his school newspaper. The influence of Hancock’s early interest in cartoons is still visible in his current work. After that he earned a MFA from the Tyler School of Art at Temple University, Philadelphia. This artist talks about feeling a deep connection with the mounds of earth. Each new work by Hancock is a contribution to the saga of the Mounds, portraying the birth, life, death, afterlife, and even dream states of these half-animal, half-plant creatures. Influenced by the history of painting, especially Abstract Expressionism, Hancock transforms traditionally formal decisions—such as the use of color, language, and pattern—into opportunities to create new characters, develop sub-plots, and convey symbolic meaning. 19 ¼ in. x 17 ¼ in. Bye and Bye (Elephant) is part of a series of the nine sad etchings of Bye and Bye. The Bye and Bye is about the death of Mound #1 (which is part of a group of creatures, half animal and half plant, created by Doyle). The mount #1 was a peaceful being represented in the first plate as a dead tree with skeleton hands. The remaining plates show different animals that have put their predatory instincts to pay homage to him. Each piece has handwritten text of the animals compliments to the dead mount. In the elephant, the text is backwards. [description:] Black and white drawing with a hint of red in the eye of the elephant. The elephant seems to be in distress. The trunk of the elephant is wrapped around the branch of a tree behind him. The elephant takes almost all of the space in the surface of the piece. The bubble with the text inside of it is located in the left side of the piece, from top to bottom, coming out of the elephants trunk. Bye and Bye (Lion) is part of a series of the nine sad etchings of Bye and Bye. The Bye and Bye is about the death of Mound #1 (which is part of a group of creatures, half animal and half plant, created by Doyle). The mount #1 was a peaceful being represented in the first plate as a dead tree with skeleton hands. The remaining plates show different animals that have put their predatory instincts to pay homage to him. Each piece has handwritten text of the animals compliments to the dead mount. The lion text end with “The presence of the great mount was felt by us all and shall be missed… Oh, by the way, I suggest you guys scatter, eulogizing makes me hungry.” which adds on a sense of humor that Doyle possesed. [description:] Black and white drawing with details in red, only present in the lions eyes. The only body part of the lion that is visible is his head. He is coming out on the woods. The bubble with the text is not coming out of the lions mouth, its rather trapped by his teeth as if it was a pray. Bye and Bye (Mound Skeleton) is part of a series of the nine sad etchings of Bye and Bye. The Bye and Bye is about the death of Mound #1 (which is part of a group of creatures, half animal and half plant, created by Doyle). The mount #1 was a peaceful being represented in the first plate as a dead tree with skeleton hands. The remaining plates show different animals that have put their predatory instincts to pay homage to him. This piece is considered the main one since the rest of the characters are centering their attention to him. The main subject is divided into two different pieces, this piece represents the body of the mount. [description:] This piece is different from the rest because the mount skeleton was painted with no background. The body of the character is a tree with a great amount of blanches, leading up to the head. The head is a skeleton. Bye and Bye (Mound Skull) is part of a series of the nine sad etchings of Bye and Bye. The Bye and Bye is about the death of Mound #1 (which is part of a group of creatures, half animal and half plant, created by Doyle). The mount #1 was a peaceful being represented in the first plate as a dead tree with skeleton hands. The remaining plates show different animals that have put their predatory instincts to pay homage to him. This piece is considered the main one since the rest of the characters are centering their attention to him. The main subject is divided into two different pieces, this piece is a close up of the head of the mount. [description:] closeup of the skull. The background is a scene deep in the woods. The skull is exactly in the center of the piece. The skull has small horns on the top of the head. The eyes of the skull are filled with branches. Bye and Bye (Shark) is part of a series of the nine sad etchings of Bye and Bye. The Bye and Bye is about the death of Mound #1 (which is part of a group of creatures, half animal and half plant, created by Doyle). The mount #1 was a peaceful being represented in the first plate as a dead tree with skeleton hands. The remaining plates show different animals that have put their predatory instincts to pay homage to him. All the works for this series have a small amount of red in them, but the Shark is the one that has the most amount of it. [description:] Black and white drawing with the inside of the shark’s mouth red. The shark is poking his head out of the water. Out of the mouth, the bubble with text is coming out, creating a spiral upwards. Bye and Bye (Squirrel) is part of a series of the nine sad etchings of Bye and Bye. The Bye and Bye is about the death of Mound #1 (which is part of a group of creatures, half animal and half plant, created by Doyle). The mount #1 was a peaceful being represented in the first plate as a dead tree with skeleton hands. The remaining plates show different animals that have put their predatory instincts to pay homage to him. [description:] black and white drawing with a hint of red in the squirrel’s eyes. The squirrel is talking through the trunk of the tree. The squirrel’s head in pointing to the bottom of the paper, and the bubble with text is coming out of the mouth, curling upward. Bye and Bye (Ostrich) is part of a series of the nine sad etchings of Bye and Bye. The Bye and Bye is about the death of Mound #1 (which is part of a group of creatures, half animal and half plant, created by Doyle). The mount #1 was a peaceful being represented in the first plate as a dead tree with skeleton hands. The remaining plates show different animals that have put their predatory instincts to pay homage to him. [description:] Black and white drawing with details in red, which are the flowers in the ground. The ostrich has its head deep in the soil, and from various holes in the ground, the bubbles with text are coming out. The bubbles are pointing upward. Bye and Bye (Zebra) is part of a series of the nine sad etchings of Bye and Bye. The Bye and Bye is about the death of Mount #1 (which is part of a group of creatures, half animal and half plant, created by Doyle). The mount #1 was a peaceful being represented in the first plate as a dead tree with skeleton hands. The remaining plates show different animals that have put their predatory instincts to pay homage to him. This is the only animal piece that contains more than one animal and also has no bubble for the text for the main character. [description:] Black and white drawing and has details of red in the eyes of various animals. The zebra is surrounded by animals and text. They are deep inside a forest full of trees. The text is covering most of the background. 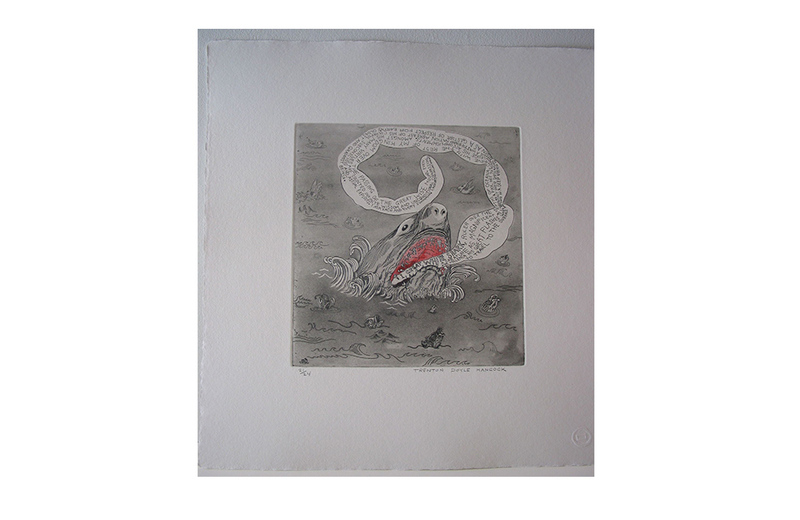 Bye and Bye (Crocodile) is part of a series of the nine sad etchings of Bye and Bye. The Bye and Bye is about the death of Mound #1 (which is part of a group of creatures, half animal and half plant, created by Doyle). The mount #1 was a peaceful being represented in the first plate as a dead tree with skeleton hands. The remaining plates show different animals that have put their predatory instincts to pay homage to him. [description:] Black and white drawing with red details in the eyes of the crocodile. The crocodile is drawn at the edge of a lake, as if it was going into the water. The bubble with the text is coming out from the mouth of the animal, swirling around it, ending at the top left corner.